It’s starting to get pretty chilly here in DC and the rain isn’t helping any. On days like these, all I want to do is snuggle on the couch with a really good book and eat comfort food, which includes any type of carb. One of the dishes I start to crave the most is a sesame peanut noodle dish that my mom always used to make when she didn’t feel like making anything too complicated. It’s great because you can customize it to your own tastes, and extremely simple so even if you’re living in a college dorm like me, it’s definitely manageable. I usually like to add shredded soy-poached chicken leftovers and lots and lots of hot sauce, but if you’re vegetarian, the dish is filling enough to be eaten without any meat. The sauce is wonderfully creamy and the flavors balance so well, with sweet countering savory perfectly. I’ve made it enough that I don’t really use formal measurements, but I adapted the original recipe from, who else, Mark Bittman in his book, The Best Recipes in the World. 1. Cook the noodles in boiling salted water until tender. Drain. 2. Whisk the peanut butter, soy sauce, sugar, vinegar, hot sauce, and salt. Gradually pour warm water into the mixture and continue whisking until the consistency of the sauce resembles heavy cream. Adjust the seasoning if needed. 3. Toss together the noodles and the sauce and add any more seasoning if necessary. Drizzle with additional sesame oil, if desired, and garnish with scallions. This dish tastes good both warm and cold, so save leftovers! So easy to make and yet packed fullof flavour!! Love this recipe! 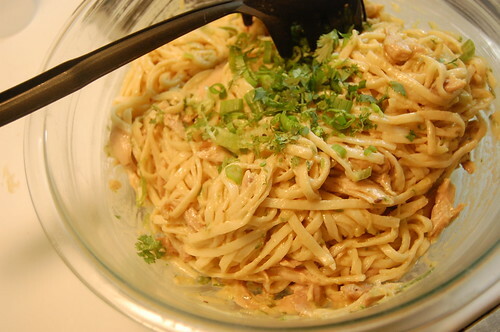 You are currently reading Asian comfort food: sesame peanut noodles at Notes on Food.